Although none of the participants of the "Longevity Survey" mentioned this book, I think it is one of the most important books regarding hidden food and drink toxins that exists: Excitotoxins: The Taste That Kills by Russell Blaylock, M.D. The information imparted by the book has only become relevant since the exponential increase in availability of processed foods. The doctor discusses many of the hidden ingredients, or rarely discussed ingredients in just about all processed foods, and how those ingredients might be destroying our health. It is amazing how all of the health and nutrition proponents urge readers, consumers, eaters, etc., to "get their proper share of vitamins and minerals", but they rarely zoom in on those ever-present, multi-syllable ingredients, many of whom destroy brain cells! The people of today who expect to live long lives would be wise to more carefully scrutinize food labels. Just think most of those centenarians didn't have to worry about food labels, as the food and drink they ate was relatively pure and natural. Organic before the "organic movement". Thanks Ilinda! That book and numerous articles mention that the amino acids which are often-supplemented building blocks of protein include a few stimulants / excitotoxins. 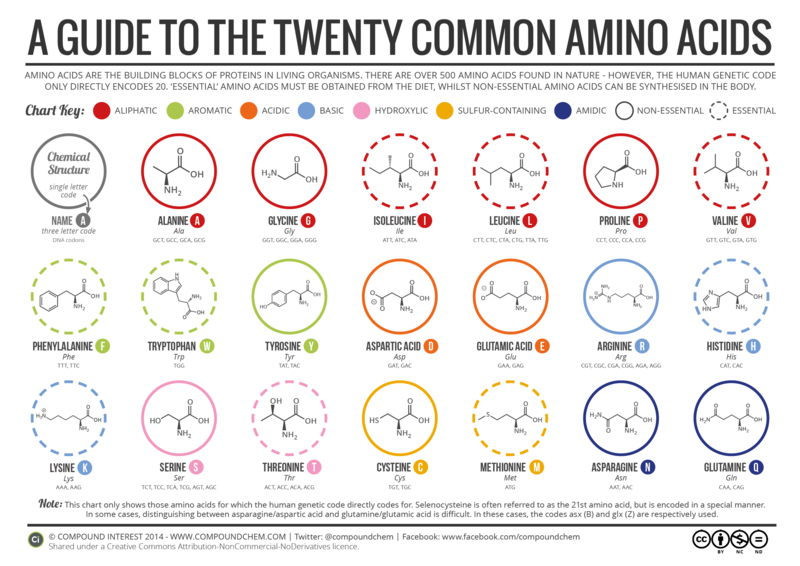 Thanks, RR, for posting that neat little chart of the amino acids. Interestingly, when Dr. Blaylock wrote about MSG, revealing the truth about it, the food additive industry reformulated MSG, or monosodium glutamate. They used other forms of glutamate, which are not identical to either MSG or the amino acid gluamine, as the addicting chemical in processed foods, and often placed on the food label, "contains no MSG" or "MSG free". Dr. Blaylock states that the other, non-sodium, forms of glutamate, are just as deadly. "They" will always be one step ahead of the truth tellers, as they are determined to have those addicting additives on our food and drink. Just announced: a new form of NAD+ (oxidized NADH) is being developed that is expected to significantly extend the human lifespan via cell regeneration. Numerous people suffering from Parkinson's Disease have experimented with NADH for its ability to inhibit tremors, restore a natural walking gait, and replenish energy, as well as to halt progression of the disease. The supplement is only available over-the-counter from health food stores or on-line at the present time. Other substances closely related, and part of the redox cycle of NADH, are PQQ and CoQ10. People with Parkinson’s disease have dwindling supplies of the neurotransmitter dopamine. There is early evidence that NADH supplements may raise levels of dopamine, which is crucial to slowing the physical symptoms of Parkinson's disease and relieving the depression that often accompanies them. NADH is the metabolically active form of vitamin B3, also sometimes called NAD(P)H. Supplements of this nutrient offer an exogenous means of stimulating tyrosine hydroxylase in order to boost natural levodopa production in the brain, thus potentially reducing or eliminating the need for prescription levodopa, which is required in ever-greater and toxic amounts in order to maintain the initial level of effectiveness. One of the main reasons for toxicity of prescription levodopa is that it depletes the body of B3 / NADH, creating a vicious cycle in a disease that may already be aggravated by depleted stores of this nutrient. This was discovered as early as 1979: (Bender DA, Earl CJ, Lees AJ. "Niacin depletion in Parkinsonian patients treated with L-dopa, benserizide and carbidopa." Clin Sci 1979;56:89-93 http://www.ncbi.nlm.nih.gov/pubmed/477187 ). A later study in 2013 postulated a connection between pellegra, a B3 deficiency syndrome, and Parkinson's Disease. While the study does not go so far as to claim that the two diseases are one and the same, it does explore a shared metabolic pathway connection. ("Parkinsonian features in a case of pellagra: a historical report." Cavanna AE1, Nani A, Williams AC. http://www.ncbi.nlm.nih.gov/pubmed/24028927 ). Parkinsonian patients taking NADH intravenously showed a "significant response," and "significantly increased bioavailability of plasma levodopa." Oral supplementation studies in the 1990's proved ineffective however, due to shelf-life instability of NADH tablet processing methods in that era (they literally lost all potency within a few weeks of being produced) and due to lack of bio-availability via the digestive tract. Then in beginning in 2002, a new method of processing oral NADH to protect it from the digestive tract and endow it with a stable shelf-life, called the Enada method, produced the first usable supplement on the market. Dosages range from 5-25 mg, with 10 mg daily being considered safe for longer term usage. The higher range is best taken in the morning, as it may cause insomnia. Later in 2015 two small companies further improved oral supplementation by attaching the NADH molecule to ADP-ribose under the supervision of several Nobel Laureates, according to Scientific American (David Stipp, March 11, 2015: "Beyond Resveratrol: The Anti-Aging NAD Fad."). The two new supplements are marketed under the names of Niagen by ChromaDex and Basis by Elesium Health. NADH does appear to offer promise, but I noticed in the last paragraph in the review of studies, that it is stated that "Finally an actual clinical trial..... It demonstrated statistically significant increases in endogenous NAD levels in healthy subjects from a single dose of the ribose form of supplemental nicotinamide. " In spite of the eventual harm to the endogenous NAD cycle that is done by prescription levodopa/carbidopa, there is a catch 22 in that the drug has long ago received FDA approval, meaning that it no longer must receive IRB clearance. IRB (institutional review board) approval is necessary before a newly proposed drug or supplement that has not received FDA clearance can be trialed experimentally on any disabled or under-age population. So it is easier and risks less liability for each institution or physician to just stick with what has already been approved. Though NAD may be at the cusp of winning FDA approval, I'd expect a fight from the pharmaceutical industry first, in the form of a published attack on the clinical trial structure (looking for a confounding variable, etc.). That's just the way it works, and why we have refereed peer reviewed professional journals in which to fight it out. Meanwhile - many of those who are self-educated and experiencing early symptoms of PD have for many years now been taking their health in their own hands and experimenting with NAD on themselves by obtaining it over-the-counter. They have stood to lose nothing, as it is an endogenous substance belonging in the human body, and it is well-known to be lacking in PD. Those individuals who have taken the initiative with their own health may have halted forward progression of their illness, in other words maintained baseline, while awaiting approval for clinical trials of NAD specifically on the PD population, which would necessitate these individuals abstaining from levodopa/carbidopa - which some M.D. 's who are more comfortable with a drug approach might try to argue would place them at risk of disease progression. Clinical trials may also need to be performed separately on populations suffering from different categories of PD (with and without Lewy Body presentation in the brain). One interesting thing to point out is that the population at greatest risk of PD is male farmers, according to at least one study that I came across. That alone should suggest causality, but I won't mention the "M" word. Therefore, it might be wise for those farming with non-organic methods to take NAD prophylactically, regardless of clinical trials. Anyway, I too have read that those who use pesticides have a higher risk of "getting" Parkinson's Disease. IIRC, there may be a specific category or type of pesticide associated with PD, but any synthetic pesticide is risky, for my 2 cents. In one episode of a health/medicine series I recently viewed, one M.D. said something that makes total sense, but I had never given it any thought before. He said that our bodies did not evolve while being exposed to these synthetics, whether pesticides, pharmaceuticals, vitamin analogues, etc., and that our systems for handling or detoxifying don't know how to deal with these alien and foreign chemicals, so they do the best they can. But often the end-products of the detox or breakdown may be even worse than the original products! Re: Longevity secrets from around the world: Recent findings in the U.K.
Two universities in the U.K. (Exeter and Brighton) have collaborated to isolate and synthesize additional compounds of resveratrol, in a successful effort to re-stimulate sluggish aging cells to resume robust cell division. Resveratrol also exists in multiple forms in nature. In the process, they discovered that the compounds could also lengthen telomeres, an accomplishment above and beyond previous efforts to merely prevent these brain cells from being shortened. Musings: The 2014 Harvard study, though commendably utilizing a large test pool of 800 subjects, merely measured the amount of residual dietary resveratrol in urine in an elderly study population that specifically did not make an effort to supplement in order to raise their micro-nutrient status to baseline, and a sub-section of whom indulged in alcohol and tobacco use during the study (more than a small amount of alcohol in wine daily can actually defeat the health benefits and raise the level of nutrients needed in order to achieve baseline nutritional status). Per a 2010 study by the University of Massachusetts, elderly test subjects who did not supplement micro-nutrients were found to suffer, either clinically or sub-clinically, from a vicious cycle of aging-related degenerative illnesses that required correction prior to commencement of any nutrition-based studies on them, in order to prevent introduction of confounding variables into the studies. In other words, sub-clinical malnutrition is itself a confounding variable that can skew results of clinical trials in aging populations. An example of clinical vs. sub-clinical malnutrition might include overt fatal Pellagra vs. a chronic rash or diarrhea without the third and most severe symptom of hallucinations. ( https://www.researchgate.net/publication/41623838_A_Vitaminnutriceutical_formulation_improves_Memory_and_cognitive_performance_in_community-dwelling_adults_without_dementia ). So perhaps unwittingly, the researchers in Harvard's 2014 study, though it largely was carried out in Italy, neglected to familiarize themselves with the relevant, contemporary 2010 landmark work conducted by fellow-researchers within their own state of Massachusetts? In their defense, though, may be that differing forms of resveratrol are being discussed in the 2014 trial vs. the more recent one. Red grapes, red wine, peanuts, soy, berries, and Itadori tea (made from Japanese knotweed: https://en.wikipedia.org/wiki/Fallopia_japonica ). "Red" can also denote other deeply colored grapes, berries and wines. Of the red wines, those from the thickest-skinned grapes have the highest resveratrol content, including Malbec, Sirah, St. Laurent, and Pinot Noir. The lesser-known Southern Muscadines, likewise thick-skinned, are also used to make a high-resveratrol content wine though the lion's share of the phytochemical originates from the seed rather than the skin of that species. Malbec contains the highest amount of resveratrol in the above list, as far as from grapes in which the phytochemical is concentrated in the skin, as opposed to the seeds. And even if GM foods aren't banned in the locales known for longevity, the oldsters never ate it during their youth or earlier adulthood, as it did not exist at that time.